Chase pest birds away with our Giant Scare Eye visual bird chaser. 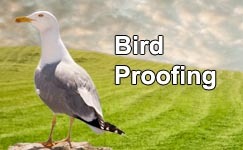 Scary eyes and a moving tail strike fear and repel unwanted birds. Available in yellow, white, black or as 3-pack (one of each color). The Giant Scare Eye bird chaser will scare away flocks of nuisance birds who are repelled by its bright color and unusual design. 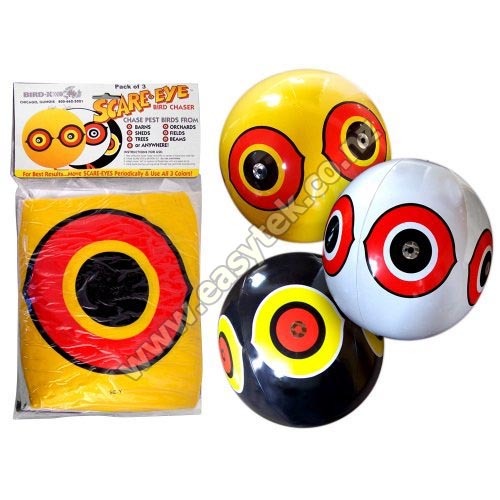 Our Giant Scare Eyes come in three colours: yellow, white and black. Research shows that maximum effectiveness is obtained by rotating colours. Hanging vinyl ball with reflective Mylar “eyes” and reflective "tail". Available in three colors: yellow, white and black. Scare Eye is perfect for Barns, Gardens, Homes, Boats, Sheds, Fields & Orchards, Trees and anywhere else where there is a pest bird infestation. For best results move Scare eyes periodically and use all three colors. Giant Scare Eye - 3-pack reviewed by Graeme G., New Plymouth on 2017-02-08 . Giant Scare Eye - 3-pack reviewed by Allan J., Napier on 2015-06-02 . Giant Scare Eye - 3-pack reviewed by Gael H. on 2014-12-17 . I had to put the 3 of them across the garage to stop the birds but now my car is poo free. Giant Scare Eye - 3-pack reviewed by Grahame H. on 2014-11-13 . Not sure of effectiveness yet. Giant Scare Eye - 3-pack reviewed by Thomas . on 2013-09-02 . Giant Scare Eye - 3-pack reviewed by Fiona M. on 2012-11-22 . Giant Scare Eye - 3-pack reviewed by Graeme T. on 2012-11-17 .
wonder how robust will be longer term. attachments seem a bit weak but we are using on a moored yacht by attaching up the mast. very good service, quick dele=ivery and no surprises with product ie what we got was what we saw on web pages. good stuff. we have tried lots of bird scaring paraphenalia over the year, if this works long term ( ie a summer ) it will the best so far! !